At „the Stolle“ I got this year unfortunately „only“ one new best time: 400mMedley in 5:05,12. This is an improvement of slightly more than a second. The big rate of increase at this distance during the last years I will probably not get any more, but I will try to get a little bit closer to the 5min. 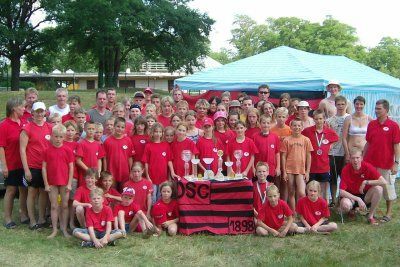 The season began with the first competition at the 22.09.2007 in Plauen in a short pool with new best times over50mFly (27,19s), 50mBack (29,02s) and 100mFly (1:00,66min). With this the minute for 100mFly is close. But a forecast if I can reach it I will not give. When I was 14 years old I said that I wanted to swim 29s over 50mFly. I did it 10 years later. 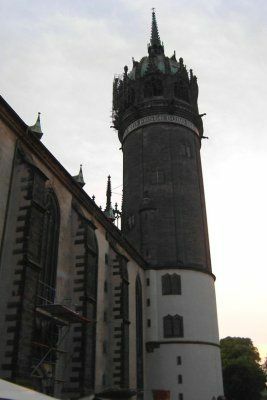 The first competition in a long pool was the local test competition at the 30.09.2007 in Dresden. Over 200mFree (2:10,10min), 200mBreast (2:47,43min) and 200mFly (2:18,62min) I got with big surprise 3 new best times. Over 200mFly I finally reached the my time that I did at the DM-Masters 2006 in Berlin and was even better. This year I have chosen all three Triathlon-relays. At first there was a beginners relay (300m/13km/3km), then a standard relay (800m/39km/8km) and at the second day the Knappen-Man relay (2000m/80km/21km). My constitution at the end of the open water season was pretty good this year because of the continous workout and therefore I wanted to leave the water as one of the first. The 300m for the beginners relay is swimming in a prianha pool. At the start I am not too fast, to prevent myself from „exploding“ after the first buoy. Because of this I have to outrun several swimmers. At this short distance I did it in an optimal way I left the water as frist. Our biker Paul Scheibner made a save advance and Martin Buchholz kept it to to finish line. At the standard replay the rivalry is always harder. Because at the Knappensee the route has always a 90° turn after 100m, one has to get for a good starting position and has to distance from the others very soon. Again I did it not so fast after the start, so that 7 swimmers were in front of me. Short after the turn I outran a lot and got closer the the leading one Marco Schiemenz. At the beach I was frist at the sand, but Marco left the water much better because of his body height. At the handover to Paul Scheibner, who again did the bike part, the order switched again. Inclusive handover I did it in 10:52min, which is significantly faster than in the last years. Having the twice as old Dietmar Wuth in his back Paul got a small advance of a half minute. Our runner Daniel Naumann had to absorb a hard attack at the second kilemeter by Christian Zschorlich, but could ourun him 500m before the finish. At sunday I had a completely different team for the big relay. Edmund Küchler was on the bike and Matthias Herrmann was the runner. Matthias was with me at the O-See and with Edi I did a Knappen-Man during the last years. At 2000m swimming the start is not so tough, but nevertheless there was a fight for the first turn. At the first lap I outran some others as planned and made contact to the two leaders one of them bein Marco Schiemenz. No water in the galsses, almost no stitch and an exceptional good feeling in the water made a lot of fun. Short before the finish I could catchup to the feet of the two leaders and made a handover to Edi with a good start position for the bike part. Edi made the distance to Dietmar Wuth bigger and bigger each lap but was outrun by another biker. Therefore Matthias was 2 minutes behind the first at the handover and was almost 4 minutes in front of Christian Zschorlich, which was the toughes rivale. After 5km Matthias was the but Christian Zschorlich closed up very fast. Unfortunately he got big problems with his achillobursitis and had to give up. What a pity. This team would have deserved the first place. Because of this Matthias was fee, made a good race and finished first. With a big surprise the second Ralf Harzbecker followed only 2 minutes behind him. He was startet 12 minutes after Matthias. 3 relay starts and 3 times victorious. Obviously I had a lot of luck at the personnel bazar and had realy good bikers and runners in the team. And for winning in addition to certificates, sparkling wine and cup we got a ... tadaaa ... bread! And it was tasty! After the O-See-Challenge with the short 1.1km, I drove to the Müggelsee for 2.6km. They pretended, that we got 22°C water temperature – obviously to be save to say, that Neopren-suits are forbidden. There were not so much alags in the water this year due to the wind direction. So this leaves only the problem of the unpredictable water flow. At this pure swim competition there was a lot more rivalry. The prominence raced for the feed of the favorite and winner Jan Gräfe. I tried to get bogged down at Jenny Wachsmuth, but after she noticed the first other lady I could not hold it. At the end Jenny has chosen the straigter heading and could even get the first place in the ladies competition. Approximately at the half of the distance, where I had to break off from the leading groups, 3 chasers got me, with two of them being ladies. I was unable to follow their speed, but they swam a disadvantageous zig-zag course. Therefore I soon tried to swim my own route. Despite the worse course these 3 were slightly faster than me at the finish. With 40:52min I was more than 4 minutes faster than last year and got15 place, with is 6th place in the mens competition. Because of the long straing course, whith one has to keep very closely, waves from boats und the unpredictable water flow, which does not only breaks but apparently makes waves the Müggelsee is a very special open water challenge. At the Olbersdorfer See, southward from Zittau I did a Cross-Triathlon in team with the Mountain-Biker Lutz Baumgärtel and the runner Matthias Herrmann. 1.1km swimming, 36km bike and 9km running were the distances. At 20.6°C water temperaturs and sun I had optimal coditions in the water and was able to break away after a third of the distance and to extend my lead. I was only hunted by one competitor who I was 10s behind me at the end. All the others were at least one minte slower. Lutz did a great ride and extended the lead Matthias ran safely to the finish. Alltogether we were 6 minutes faster than the second team. The Elbe-Swimming is not a competition. But this does not mean that one has to swim lowly. From the Bridge Blue Wonder to the Ferrygarden Johannstadt was the course that I swam in 20min. The Elbe was astonishing clean. Only floating parts of sand and earth have been there a lot. 1950m was the distance from the south shore of the Binnenmüritz from Ecktannen to Waren. At approximately 19°C water temperature, sun and almost no wind 550 swimmers took part. This time I got an optimal start position short behind the favorites and winners Jan Gräfe and Jenny Wachsmuth. Jenny is slightly faster than me but up to the half distance I can swim at her pace very well and side by side we both take benefit because we don't need to look straight ahead so often. Some water in my glasses and stitch did brake me a little bit but it was enough for the 6th place and winning in my age group. 2000m and 1000m have been done with mass start and 500m as single time trial. After a training week in the pool with a lot of muscle aches I reduced training intensity for some days and it was worthwile: As fast as this year I have never been in Cossebaude. 25:35min for 2000m are nearly 2min faster than my old record and about 12:41min for 1000m and 6:12min for 500m I was very happy. Maybe the course was slightly shorter, but anyway the conditions have been perfect: 23°C water and for the both big distance much sun. It has been col and changeable. At 18°C water temperature I tested the water some days before at Cossebaude having stormy rain. After this motivation was big and respect for the cold even bigger. At the Sund clouds went awya, sun was coming out but the wind was stormy. Approximately 1m waves with foam crown were the result. Because of the many popular sports men the only right decision was taken: we did not cross the Sund. Instead a small course at the beach of Stralsund was prepared. It was said that it was 1500m, but it has been only 1000m. Because the beach of Stralsund is fastened, one has to use stairs to go into the water. If 1000 swimmers walk over one staiway, it takes a time. Because of the cold water I pushed one's luck and went into the water 5 minutes before start. Unfortunately the start was done 4 minutes too early and I have been more than 100m aways from the start line. Therefore I made a pusuit thorugh masses of breaststroke swimmers, had a battle with the water in my glasses and though breathing because of approximately 17°C water temperature. At the finish line I got the 26th place. Next time I will be better! What a weekend! 3 days a wonderful competition, 4 single starts with each a new best time and several successes. It began at friday with the 4x100m medley mixed relay. Last year we got 3rd place at this competition. This year we were not fast enough (4th place) but I got a new best time at 100mBack: 1:03,97min. Not more than 2 hours later I had to verify this time with in the single competition: 1:04,01min and this was 1. place! As the heat sheets were online I was hoping for a maybe 3rd place but that I've got the title is really overwhelming. At the evening there was the 4x50mFree medley, in which we could achive 3rd place in a heartbeat final..
At saturday the 50mBack were set. The start was very difficult, because of the low overflow fluting and the high stopper there was a big area which is not allowed to use. Because of this my start was very cautious – too cautious. Nevertheless I swam 30,13s and got 3rd place in a hearbeat final. With this and the titles over 200mBack and 100mBack I say goodbye to the age group 25 in in the next season I will make AG30 unsafe. Only 45min after the 50mBack at Saturday the 100mFly were set. There the reivalry is simply bigger but Nils Rix (winner of 200mFly) and I made again a haunting race, at wich Nils got the 2nd place with a hairbreadth before me and I got a great 3rd place (1:01,67min). The winner (Jens Kuhlmann) swam considerably less than 1min and was simply a grade better. Sunday began with the 4x50mMedley mixed. 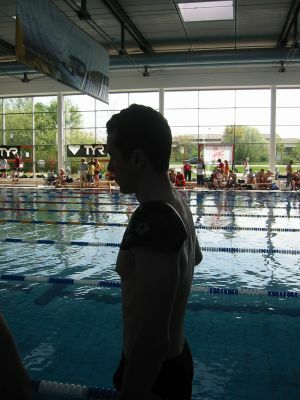 I again got the backstroke part, but was not able to swim at the same level as at the day before. Handmade time measurement says apporoximately 30,40s. Nevertheless we've got 3rd place begin totally surprised. The last start for me was the 50mFly. The tactics: „much propulson, few breaths“ hit, although I neglected leg movement a little bit: 27,63s and again 3rd place. With this my best result in points advances with 9 points (0,14s)! The LTC was a pure training competition for me with all 5 races over 200m at only one day. All starts happened approx. in an 1 hour rhythm. Finally I was able to beat my very old best times over 200mBreast (new: 2:50,62min) and 200mFree (new: 2:11,31min). However at the German Masters Championship in Osnabrück in a relay I was significantly faster. With a big surprise at my 4th start I was able to beat my best time over 200mMedley: 2:23,52min. The old best time was from the German Masters Championship 2006 and was done with much more preparation and rest. 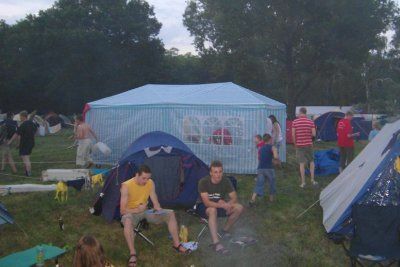 A weekend with much sun, wonderful water (including fully automated time measurements), camping with a lot of fun, a nice town festival and with a lot of best times. Over 100mBack 1:01,77min and therefore first place. I was 0,2s better compared to a handmade time. Now there are „only“ 0,5s to the competition record. ;-) Over 100m medley 1:04,31min (more than 1s better), at the 8x50m medley relay as start swimmer 29,17s over 50mR (0,5s better), over 100mFly 1:01,74min (handmade time confirmed), over 100mBreast 1:15,77min (over 3s faster because of fly-kick at diving pull) and over 100mF 58,09s wich means exactly 0,5s faster. 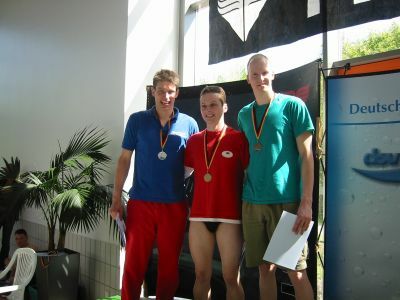 My objective was to defend the title of 200mFly und 200mBack. Furthermore I wanted to swim 4x200mB, 4x200mF and 400mM. Over 4x200mB we (Thomas Moschke, Dietmar Sebald, me and Steffen Langner) wanted to be the state of the art – to be precise: the last. Although we take it with humor, we gave everything. After I started with long pool best time over 100m (1:19,11), I swam a 02:46,36, which is quite a good time for me. My team members swam great too and finally be finished at 4th place. After the fastest team was disqualified we (totally unexpected) won the bronze medal. 200mBack was quite tougth this time with 4 opponents, being all quite dangerous. Among them Bastian Drees, the second of last year a my training partner Christian Pfeifer. After the other opponents let us 3 go after 100m, we pushed us into a tough finish that I could decide for me with a new bet time (2:19,08). A couple of hours after the 200mBack I swam the 200mFly. Unfortunately I was not able to swim it smooth. Furthermore I made the mistake of eating too much. After the 100m turn I was a little bit shocked as Nils Rix made an unbelievable race beating his own best time for 4 seconds and forcing me to 2nd place. I was with 2:19,87 almost 1 second slower than best time but after 1 year I finally swam faster than 2:20min for the 2nd time. Over 4x200mF we had a slight hope to get a good place but this time the other teamFly were simply faster. We reached a good 4th place. I swam for the first time below 2:10min and got a 2:08,80 (flying). I wanted to beat my best time over 400mM and to be better that the bad time last year. Butterfly was great, but slightly too fast. Backstroke was dull and even being 2 body lengths in front I knew that it would not be enough for a medal. Breaststroke was acceptable but at freestyle I finally was too exhausted. So I swam 1s slower than best time: 5:07,15. I should have done butterfly a little bit slower. To conclude: It was a great success: 3rd place Platz over 4x200mB, 2nd place over 200mFly and 1st place with a new best time at 200mBack.